The White House boasts that it has granted "more" commutations of sentence than the most recent presidents but the PR exercise fails to acknowledge 1) those presidents were negligent by almost any standard and 2) those presidents received far fewer requests for commutations of sentence. 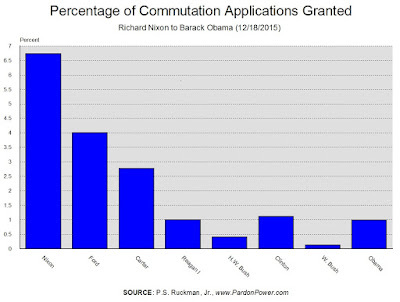 Indeed, Obama has received more commutations applications than all five of the previous presidents combined! If we control for the number of requests, by looking at the percentage that have been granted, well, one can see that President Obama is no Ford or Nixon!